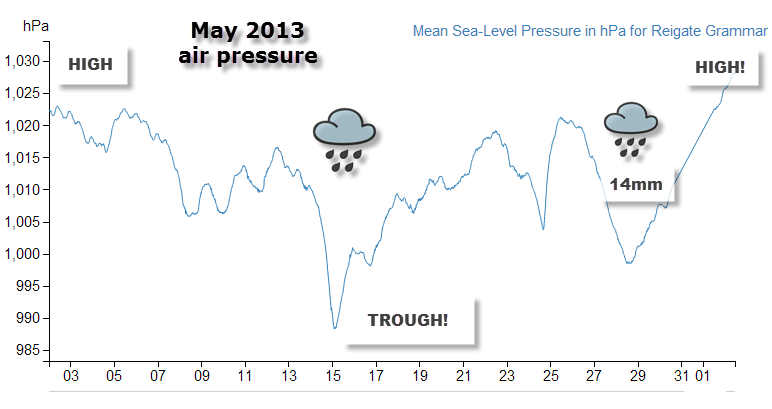 Reigate May 2013 summary: a cold-rinse cycle! After a good start with temperatures climbing to 22ºC in the first week, May 2013 was dominated by the UK being stuck in a TROUGH (low pressure) of relatively cool air producing occasionally convective heavy showers and unsettled weather. We called it a “cold rinse cycle” and, nationally, it was the coldest May since 1996. Whilst Reigate escaped the worst of this, some parts of North and West and NE of the UK suffered downpours and thundery showers. A meridional jetstream flowing north-south fed cool upper air down to Europe from Polar regions making the UK and France rather cool while Eastern Europe (on the northward limb of the jet) was bathed in warm air from the Med: heat wave! The other effect of a meridional jetstream is that weather systems get stuck and don’t move. 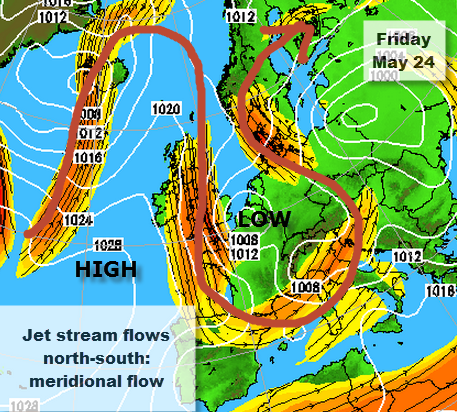 So it turned out that the trough over Europe did indeed not budge far for the whole of May. With HIGH pressure shifting north this week, the Euro-trough continues to linger to the south of the UK for the start of June. The persistent LOW pressure over Eastern Europe has caused storms and extensive flooding in Czech republic and Germany, while the warm northward limb of the jetstream has caused a heatwave further north in the Arctic (Finland reached >30C!). The trough of low pressure over Europe was persistent and air pressure in the SE of the UK stayed pretty low throughout mid-May. The northerly jet stream pegged back temperatures too, allowing strong May sunshine to kick off showers.As you’d expect, there was a good correlation between lowest pressure and episodes of heaviest rainfall. Nevertheless, periods of showery activity were very tricky to forecast and the GFS model seemed to over-do the rainfall over SE England on several occasions, seemingly not at ease with an easterly flow. Nationally, Spring 2013 has been the coldest for 50 years. Interestingly, June seems to be starting in a similar way with HIGH pressure drifting to the North and a trough sticking over Europe… time will tell as to how unsettled it gets after this first week of super June weather!